It seems I’ve tried a different approach each time, not intentionally…this just confirms that I am completely unable to settle in on any one particular way to draw or paint…as I’ve said before, the only thing consistent about my art is its inconsistency! But that makes it all the more fun and exciting. I’m afraid I would get bored too easily if I had to “stay put” with one technique, one medium, one style, etc. Art is for exploration; for asking the question,”What if I…” and actually be free to try it! Tnese are lovely sketches – won’t your daughter treasure them when she is grown!! Would I be right in guessing that there may have been a time when you may not have chosen to draw something as “every day” as this? That’s the beauty of the EDM challenges, I think, that and what Margaret mentioned but as well the more present example to her of being creative. Well, Owen, I have years of sketchbooks where I sketched my kids, my house, and other things that did not “make it” to be a full-fledged painting. 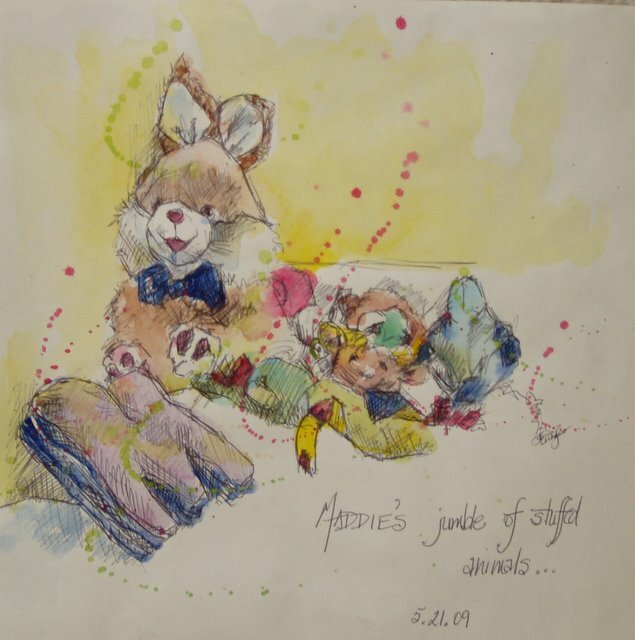 What is different now is that I am drawing and sketching not merely for developing them into paintings, but for the lovely process of drawing, for remembering the “stuff” of my life, however big or small. And so, you are right, in the sense that I am making these sketches as the art form themselves, not as a stepping stone to something “bigger”, or “more worthy”. Does this make any sense? Once again, Thank you for commenting!!!! I really like your drawings. I’m sad I can’t see the bunny – it won’t load. Stupid computer. Anyway, where is it written you have to intentionally do anything the same way? That sounds boring. You do great – keep on doing!